We’d love your help. 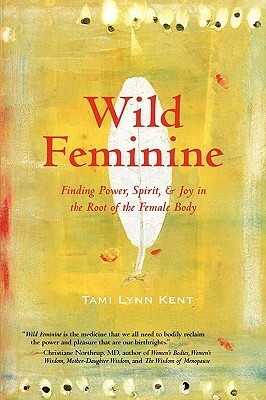 Let us know what’s wrong with this preview of Wild Feminine by Tami Lynn Kent. To ask other readers questions about Wild Feminine, please sign up. i want to give this book 5 stars because i think that i am engaging in some life-changing events because of reading this book. however, as a BOOK it was not exceptional. the author did a lot of repeating and there were more case studies than substance to the actual narrative. i think the book could be cut in half, but then maybe it would be more of a pamphlet. i wish there had been some narratives from historical matriarchal traditions or ceremonies. "I am drumming. Twenty women form a circle on the floor. They lie with heads together and legs extended... I ask the women to feel the drum's vibration in the root of their bodies. They follow the drumbeat to their womb, where life itself begins." "Suddenly the spirit of my daughter filled the room. I felt her tiny body leave mine, and I reached down to discover her placenta's perfect fit in the palm of my hand. I wrapped her hint of a body on cloth... I wandered through the day with her small b "I am drumming. Twenty women form a circle on the floor. They lie with heads together and legs extended... I ask the women to feel the drum's vibration in the root of their bodies. They follow the drumbeat to their womb, where life itself begins." "Suddenly the spirit of my daughter filled the room. I felt her tiny body leave mine, and I reached down to discover her placenta's perfect fit in the palm of my hand. I wrapped her hint of a body on cloth... I wandered through the day with her small bundle in my pocket." I tried reading this book twice, I really did. It has great exercises in it and great insights about womyn and creativity but I just couldn't push past the middle point. And then one day on a beach in India a cow picked it up when I was getting a drink and ate 20 pages out of it, just at the part that I was reading. So that was a sign. It's not that I didn't like it, it's just that I found it hard to get through and well the Bovine God had it's say! I enjoyed it very much. While at first I really didn't understand much of what she was talking about, having no background with "energy work" or things of that nature, there was a point about mid way through when it started to all click. Once it started clicking, everything she said started finding its way right into my heart. I can easily say I've never read a book like this before-specific instructions for vaginal massage, and talking about energy work of the reproductive organs, are you kiddi I enjoyed it very much. While at first I really didn't understand much of what she was talking about, having no background with "energy work" or things of that nature, there was a point about mid way through when it started to all click. Once it started clicking, everything she said started finding its way right into my heart. I can easily say I've never read a book like this before-specific instructions for vaginal massage, and talking about energy work of the reproductive organs, are you kidding me? And yet in spite of the many reasons why I normally wouldn't give the book more than a glance, so many things she said resonated deeply within me-legacies of pain in your family lineage that can be carried and subsequently healed in your body, your body holding tensions and relational discomfort in a tangible, physical way, etc. These and many other concepts I found very poetically said. I found the practical exercises very intriguing, and I would like to try many of them. Un libro molto potente che unisce spiegazioni, esperienze ed esercizi da poter integrare concretamente nel proprio quotidiano. Un libro per tutte le donne, per ampliare la propria conoscenza del loro grembo/utero/zona pelvica ritornando ad abitare coscientemente il loro corpo dialogando con esso. Super consigliato! This book took me a while to get into. Slow start. I have found that many of her pelvic floor myofascial release techniques have worked. I enjoyed her ideas around creativity. She's my kind of people. I’m giving this ne star mostly cause I have to give it something. Seriously not a book for myself and has a very abelistic overtone. life-changing. I'm starting back at the beginning as soon as I finished it. so much wisdom here. So, first of all, you have to do the Visualizations and practices in the book for it to be amazing. This is not the kind of book you read and that's it. If you feel disconnected from your body and from your femininity, then this is a fabulous book to get and work with. As a woman, this book has helped me reconnect to my body in a deeper way. I found the book very truthful. One example: Like it said, I have a habit of contracting the left side of my pelvis, when I don't want unwanted energy to co So, first of all, you have to do the Visualizations and practices in the book for it to be amazing. This is not the kind of book you read and that's it. If you feel disconnected from your body and from your femininity, then this is a fabulous book to get and work with. As a woman, this book has helped me reconnect to my body in a deeper way. I found the book very truthful. One example: Like it said, I have a habit of contracting the left side of my pelvis, when I don't want unwanted energy to come in. But that, Tami L. Kent points out, isn't effective. It still doesn't prevent you from soaking in that energy. Instead, staying energetically present in your body helps you move this energy and it also helps you stay grounded in your body. This book was a stretch at times. Somatic memory is something relatively new to me and understanding its implications in my body and women society on a whole. She has many exercises and contemplative questions that create a very well rounded book that is both informative and interactive. I'm actually always "currently reading" this one. I particularly love the exercises and meditations in the first half of the book. TLK is brilliant. My only wish is for a further exploration into daily applications. So many women I work with are split off from and/or over identified with their bodies - this book is a great one to help women befriend their bodies. Tami Lynn Kent truly understands the beauty and flow of feminine energy. I felt like finally someone was speaking my language. What a blessing to women. Good one. However, sometimes I feel like it goes around the same idea over and over and you get a little tired. I am pretty liberal and open minded, but this was "out there" even for me. It might have some good tidbits for you (I did enjoy one of the writing exercises) but overall, this was a "fail" for me. Very intense, but well worth it. Very interesting and affirming. Passed it to my daughter - think all females should read this as well as males. Continuing on with my learning. Tami Kent, MSPT, is a holistic women’s healthcare provider who guides women in interpreting the wisdom of their bodies and reclaiming the wild within themselves. With a master’s degree in physical therapy and the ability to read energetic patterns of the body, Tami acts as a bridge between the realms of modern medicine and traditional women’s wisdom. The founder of Holistic Pelvic Care, Tami has ad Tami Kent, MSPT, is a holistic women’s healthcare provider who guides women in interpreting the wisdom of their bodies and reclaiming the wild within themselves. With a master’s degree in physical therapy and the ability to read energetic patterns of the body, Tami acts as a bridge between the realms of modern medicine and traditional women’s wisdom.